NETWORK FINALS: CW’s reruns of THE FLASH and HOOTEN & THE LADY were preempted by baseball in NY, and both lost 0.1 in final numbers; however, it’s noteworthy that despite the adjustment, the HOOTEN rerun had the same rating as last week’s premiere. In addition, AMERICA’S GOT TALENT gained 0.1, tying it with last week’s final rating. CABLE HIGHLIGHTS: USA’s WWE SMACKDOWN rose 0.05 from last week to 0.81, giving SHOOTER a healthy lead-in for its season premiere, which was at 0.41, down 0.09 from last year’s series premiere (on a night when SMACKDOWN was at 0.95), and down 0.08 from the season finale (on a night when SMACKDOWN was at 0.90). BEING MARY JANE returned to BET at 0.27, down a big 0.29 from January’s premiere, but only down 0.04 from the March finale. 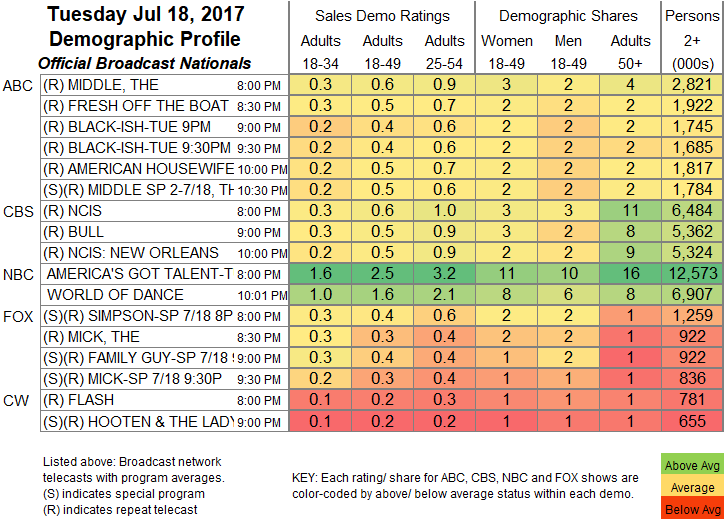 Bravo’s BELOW DECK rose 0.03 to 0.48, and A NIGHT WITH MY EX premiered at 0.23. OWN’s THE HAVES AND HAVE NOTS gained 0.06 to 0.66. On History, FORGED IN FIRE jumped 0.16 to 0.51, and AMERICAN RIPPER ticked down to 0.28. 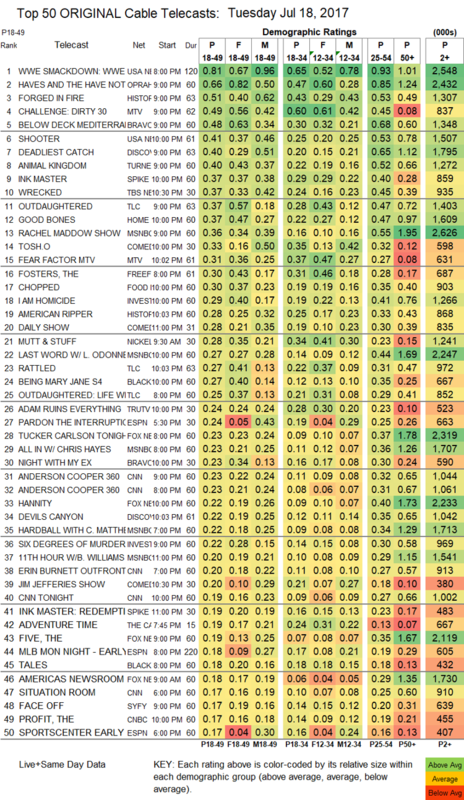 On MTV, THE CHALLENGE had an even bigger jump, up 0.24 to 0.49, and FEAR FACTOR was up 0.05 to 0.41. On Discovery, THE DEADLIEST CATCH slipped 0.02 to 0.40, and DEVIL’S CANYON was up 0.02 to 0.22. TNT’s ANIMAL KINGDOM climbed 0.04 to 0.40. Spike’s INK MASTER fell 0.06 to 0.37, and the REDEMPTION after-show was down 0.05 to 0.19. TBS’s WRECKED ticked up to 0.37. On TLC, OUTDAUGHTERED dropped 0.09 to 0.37, and RATTLED was down 0.07 to 0.27. HGTV’s GOOD BONES rose 0.03 to 0.37. On a night heavy with political news, MSNBC’s RACHEL MADDOW SHOW dominated the demo at 0.36/2.6M, above Fox News’s TUCKER CARLSON TONIGHT at 0.23/2.3M, and CNN’s ANDERSON COOPER 360 at 0.23/1M. On Comedy Central, TOSH.0 ticked down to 0.33, and THE JIM JEFFERIES SHOW ticked up to 0.20. On Freeform, THE FOSTERS lost 0.03 to 0.30, and THE BOLD TYPE was at 0.13 after last week’s premiere 0.16/0.14. Food Network’s CHOPPED gained 0.02 to 0.30. On ID, I AM HOMICIDE was at 0.29, and 6 DEGREES OF MURDER was at 0.22. On Tru, ADAM RUINS EVERYTHING rose 0.02 to 0.24, and YOU CAN DO BETTER held at 0.13. BET’s TALES shed a tick to 0.18. Syfy’s FACE OFF gained 0.02 to 0.17. A&E’s BORN THIS WAY fell 0.05 to 0.17.